An unplanned pregnancy can occur to any woman during her reproductive years. All contraceptives can sometimes fail, so you should not blame yourself if you find yourself in this situation. Current statistics show that in Australia, 1 in 3 women will have a pregnancy termination (abortion) at some time during their lives. If you suspect that you may be pregnant, your next step is to confirm the pregnancy with either a home pregnancy test, or a blood test from your local doctor. A home pregnancy test may be purchased from pharmacies, supermarkets, or we can provide you with a free test at the clinic. These tests indicate the presence of pregnancy hormone in your urine and they give accurate results when used at least 10 days after conception (or when ever your period is late) and according to their instructions. A positive result with this type of test is sufficient to make an appointment with us. Alternatively, your local doctor will be able to perform a blood test which will test for the presence of pregnancy hormone (HCG) in your blood. These tests are accurate only 5 days after conception but results usually take 12 – 24 hours to be returned. Sometimes your doctor may order a “quantitative beta HCG” test. This test measures the amount of HCG chart showing how the levels rise in the early weeks then falls after approx 10 weekspregnancy hormone in your blood and the result can be compared against a table or chart which shows approximately how many weeks you are likely to be. Blood tests usually state gestational age, so add 2 weeks to approximate the number of weeks LMP. Ultrasound reports state the number of weeks LMP. Some women have no symptoms of pregnancy and are often further along than they expect. If you have had a positive pregnancy test but don’t remember the date of your last period, if your last period was lighter or shorter than usual, or if you have any doubt, an ultrasound scan is the only reliable way to date a pregnancy. At The Private Clinic, we routinely perform an ultrasound scan on all patients, so unless you are possibly over 13 weeks, you don’t need to arrange for an ultrasound prior to coming to the clinic. If you are possibly over 15 weeks, an ultrasound scan at a radiology clinic is required before coming to the clinic. This is especially important to identify potential risk factors such as having a placenta situated over the opening of the uterus (placenta previa) and so that we can provide you with specific instructions for your appointment. We will advise you whether an ultrasound will be required when you make an appointment. 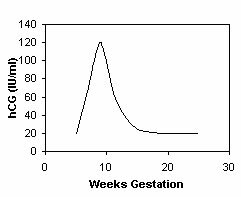 The start of the pregnancy is, by convention, measured by the number of weeks since the first day of your last period. This is abbreviated to LMP (weeks since Last Menstrual Period) and is about two weeks earlier than the date of conception. The reason that weeks LMP is used, is that prior to the invention of ultrasound scans to date pregnancies, women usually didn’t know the day they fell pregnant, so the only date that was known with certainty, was the first day of the last period. If your period is normally a 4 week, or 28 day cycle, and you have missed your period by one week, this would mean that you are now 5 weeks pregnant, (or 5 weeks LMP). Conception would have occurred 3 weeks ago. Termination of pregnancy at the Private Clinic may be performed from 5 weeks LMP.